I haven't been posting as much lately, since I've been spending a lot more time at DaisyCakes baking fantastic things on a daily basis! I am, however, going to try to start snapping more photos of the things I'm making there, even though I can't share a recipe. At least I can share some decorating tips and ideas and maybe hope to advertise a little for my new employer. 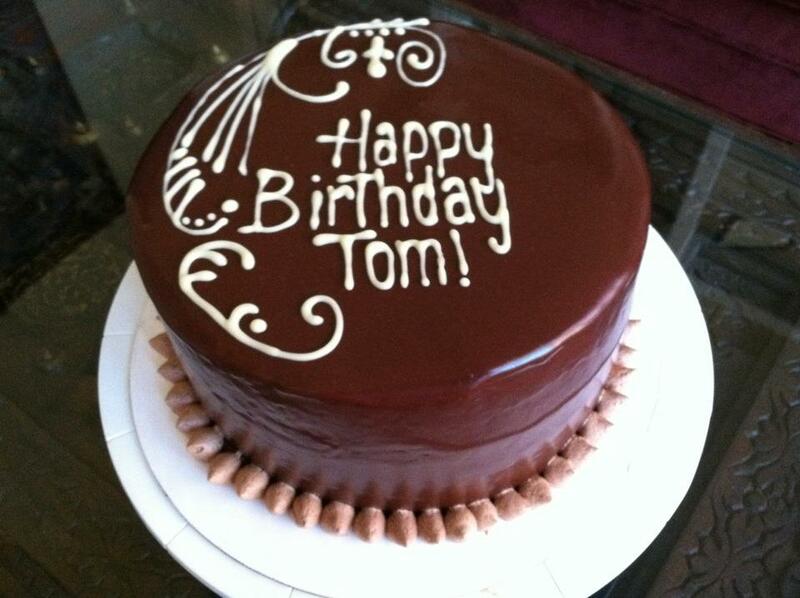 Tonight I'm starting on a "Death by Chocolate" cake that I'm making for my brother Tom's birthday this weekend. The cake is a moist chocolate cake, made using melted chocolate and sour cream. I'll cut the two cake layers in half (making four), then stripe each layer with a small amount of whipped ganache and fruit preserves. I'll also squeeze some whipped cream in between each layer. To top it off, I'll pour liquid chocolate ganache over the top, let it set and finish with an elegant chocolate design. Then, everyone's favorite part, we will cut into it and eat it!! Ahhhh...what a great way to go! Butter and line two 9” cake pans (or spray with non-stick spray). It is essential that you line these pans with parchment paper, otherwise your cake will stick and will not be able to be removed from the pan. (Trust me, I know this personally to be true...#canyousayeatingchocolatecakepiecesforweeks?) Stir sugar, flour, salt, baking soda in mixing bowl. Put chocolate in another bowl and place hot water over it. Whisk eggs in a third mixing bowl until liquid, then whisk in oil, vanilla, sour cream, and buttermilk, one at a time. Whisk chocolate and water mixture smooth, then scrape into egg mixture. Whisk smooth. Stir in the dry ingredients. Divide between prepared pans and smooth tops. Bake at 325 for 30-40 min, until well-risen and toothpick is clean. Cool on racks for 5 min, then invert, peel paper and invert again to cool. Mix equal parts chopped chocolate and heavy cream by heating the cream to scald, then pour over chopped chocolate. Let sit for 2 minutes, then whisk smooth. Allow the ganache to cool to close to room temperature (so that it will not melt the icing on top of the cake). Prepare the cake for ganache covering by icing smooth and bringing the cake close to room temperature. (You don't want the cake to be too cool, or else it will give you less time to work with the ganache once it's been poured.) Also, if you put some of this ganache in a metal bowl in the fridge or freezer for a few, and then, once it's solid, whip it up using a mixer, you'll have a nice whipped ganache that is of spreading consistency. This is a good recipe to have. Everyone knows how to whip some cream. Not everyone, however, knows how to stop. Yes, you must STOP when you have whipped cream. Or else you will get butter. Seriously. Stop when the cream is peaked. To make a delicious sweetened whipped cream, simply add 1/2 cup of powdered sugar to 2 cups cream and whip together in a bowl. Adding a little softened gelatin will help to stabilize the whipped cream, great for if you want it to hold up during travel or overnight. This part can be a little tricky, so pay attention. Get yourself about 2 teaspoons of powdered gelatin and sprinkle it over about 2 Tablespoons of cold water. This will allow the gelatin to absorb the water, called "blooming." Once the gelatin is softened, melt it into a liquid either by microwaving it in short bursts (5-10 seconds at a time) or by setting the bowl over a double boiler. Once the gelatin is liquefied, set it aside and allow the liquid to cool (but not set back up). You want the gelatin liquid to be sorta close in temperature to the whipped cream and if it's too hot it will solidify immediately when it hits the cold whipped cream. This creates hard little gelatin chunks in your cream which is not what you were wanting, was it? Once the gelatin liquid has cooled a little, pour it slowly into your mixer when the sweetened cream is at medium peaks. Keep whipping until at stiff peaks. This stabilized gelatin will be great for squeezing in between cake layers.